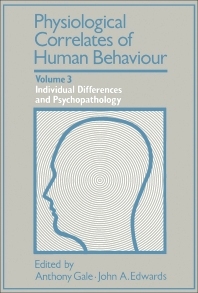 Physiological Correlates of Human Behaviour, Vol. 3: Individual Differences and Psychopathology offers an introduction to biological research into human behavior. The book discusses the three major dimensions of personality (extraversion, neuroticism and psychoticism) and the major theories of the underlying psychophysiological causes for the observed differences in behavior; and the theory of anxiety. The text also describes the measures of individual differences in habituation of physiological responses; the perspectives on pain; the cortical correlates of intelligence; and sensation seeking as a biosocial dimension of personality. The individual differences in evoked potentials; Pavlov's nervous system typology; theories of psychosomatic disorders; and the role of learning and organismic variables in criminality are also considered. The book further tackles some problems and controversies in the psychophysiological investigation of schizophrenia; the psychophysiological contributions to psychotherapy research; and the use of psychophysiological measures for investigating the influence of social factors on psychiatric relapse. Psychologists, psychiatrists, and behavioural psychologists will find the book invaluable.